Aquaman is a 2018 American superhero film based on the DC Comics character Aquaman and distributed by Warner Bros. Pictures. It is the sixth installment in the DC Extended Universe (DCEU). It is directed by James Wan, with a screenplay by David Leslie Johnson-McGoldrick and Will Beall, and is based on a story by Geoff Johns, Wan and Beall. It stars Jason Momoa as the title character, with Amber Heard, Willem Dafoe, Patrick Wilson, Dolph Lundgren, Yahya Abdul-Mateen II, and Nicole Kidman in supporting roles. It is the third live-action theatrical film featuring Aquaman, following Batman v Superman: Dawn of Justice (2016) and Justice League (2017), and the first full-length feature film centered around the character. In this film, the titular character learns he is the heir to the underwater kingdom of Atlantis, must step forward to lead his people against his half-brother, Orm, who seeks to unite the seven underwater kingdoms against the surface world. Development of an Aquaman film began in 2004, with several plans falling through over the years. In August 2014, Beall and Kurt Johnstad were hired to write two competing scripts and the film was officially announced in October 2014. Wan signed on as director in April 2015 and in July 2016 it was announced that the film would move forward with Beall's screenplay, although Wan, Johnstad, Johns and Johnson-McGoldrick all performed various rewrites. The main cast was confirmed through 2016 and early 2017. Principal photography began in Australia on May 2, 2017. Most of the film was shot at Village Roadshow Studios in Gold Coast, Queensland (with lighthouse scenes shot at the New South Wales coastal village of Hastings Point), with production also held in Canada, Italy and Morocco. Filming wrapped on October 21, 2017. Aquaman had its world premiere in London on November 26, 2018, and was released in the United States in Real D 3D, Dolby Cinema, IMAX and IMAX 3D formats on December 21, 2018. The film grossed over $1.1 billion worldwide, becoming the highest-grossing DCEU film as well as the highest-grossing film based on a DC Comics character, surpassing The Dark Knight Rises; it was also the fifth highest-grossing film of 2018 and 20th highest of all-time. It received praise from critics for its adventurous tone, performances Wan's direction ,action and visual effects but received some criticism for its dialogue, runtimeand convoluted plot . An untitled sequel is set for release on December 16, 2022 and a spin-off, The Trench, is also in development. In 1985 Maine, lighthouse keeper Thomas Curry rescues Atlanna, the queen of the underwater nation of Atlantis, during a storm. They eventually fall in love and have a son named Arthur, who is born with the power to communicate with marine lifeforms. Atlanna is forced to abandon her family and return to Atlantis, entrusting to her advisor, Nuidis Vulko, with the mission of training Arthur. Under Vulko's guidance, Arthur becomes a skilled warrior but rejects Atlantis upon learning that Atlanna was executed for having a half-breed son. In the present, several months after Steppenwolf's invasion,[N 1] Arthur confronts a group of pirates attempting to hijack a Russian Naval Akula-class submarine. Their leader, Jesse Kane, dies during the confrontation while his son, David, vows revenge. Meanwhile Orm, King of Atlantis and Arthur's half-brother, attempts to convince King Nereus of Xebel to help him unite Atlantis and attack the surface world for harming the oceans. Nereus points out that if Orm succeeds in uniting Atlantis he will receive the title of Ocean Master, commander of the most powerful force on the planet. Their meeting is interrupted when another Russian Akula submarine attacks the meeting place, apparently in retaliation for the previous submarine's sinking. Orm succeeds in destroying it and the attack convinces Nereus to join forces with Orm to defend the oceans. He swears allegiance to Orm's cause, but his daughter Mera, who has been betrothed to Orm, refuses to aid them and journeys to the surface to ask Arthur for help, earning his trust by saving Thomas from a tsunami sent by Orm. Arthur reluctantly accompanies Mera to a rendezvous with Vulko, who urges Arthur to find the Trident of Atlan, a magic artifact that once belonged to Atlantis' first ruler, in order to reclaim his rightful place as king. They are ambushed by Orm's men and Mera and Vulko escape without having been seen, while Arthur is captured. Arthur is chained and presented before Orm, who blames Arthur and the surface for Atlanna's death. He offers Arthur an opportunity to leave forever, but Arthur instead challenges him to a duel in a ring of underwater lava. Orm gains the upper hand and nearly kills Arthur before Mera rescues him. Together, Arthur and Mera journey to the Sahara desert where the trident was forged and unlock a holographic message that leads them to Sicily, Italy, where they retrieve the trident's coordinates. Meanwhile, Orm meets David, revealing that the submarine that had attacked them previously was in fact the same one David hijacked and that Orm had hired him to hijack the Russian nuclear submarine and so he could stage a false flag attack from surface, making it seem like Orm's cause for war is justified and causing King Nereus to side with him. Orm provides David with a prototype Atlantean battle suit to kill Arthur, imprisons Vulko after revealing knowledge of his betrayal, and coerces the Atlantean Kingdom of the Fishermen to pledge their allegiance to him and his campaign against the surface. After modifying Orm's technology, a fully armored David rechristens himself as Black Manta and ambushes Arthur and Mera in Sicily, grievously injuring Arthur before being thrown off a cliff to his apparent death. Mera nurses Arthur's wounds as they journey to the trident's whereabouts, and encourages him to embrace his destiny as a hero. Arriving at their destination, Arthur and Mera are attacked by the amphibious monsters called the Trench, but manage to fend them off and reach a wormhole that transports them to an uncharted sea located at the center of the Earth. There, they are unexpectedly reunited with Atlanna, who was sacrificed to the Trench for her crimes but managed to escape and reach the uncharted sea, where she has been stranded ever since. Arthur faces Karathen, a mythical leviathan and keeper of the trident, and voices his determination to protect both Atlantis and the surface, proving his worth and reclaiming the trident, which grants him control over the seven seas. Orm and his allies lead an army against the crustacean forces of the Kingdom of the Brine with the intent of completing Orm's surface battle preparations. As Orm declares himself Ocean Master, Arthur and Mera, with the assistance of Karathen and the Trench, intervene and lead an army of marine creatures in a battle against him. Orm's followers renounce their obedience to him and embrace Arthur as the true king upon learning he wields the trident. Arthur defeats Orm in combat but chooses to spare his life and Orm accepts his fate after discovering Arthur has found and rescued Atlanna. Atlanna returns to the surface to reunite with Thomas while Arthur ascends to the throne with Mera by his side. In a mid-credits scene, David is rescued by Dr. Stephen Shin, a scientist and conspiracy theorist obsessed with the Atlanteans, and agrees to lead Shin there in exchange for his help in his revenge on Arthur. A half-Atlantean/half-human who is reluctant to be king of the undersea nation of Atlantis. He has the ability to manipulate the tides of the ocean, communicate with other aquatic life, and swim at supersonic speeds, and possesses superhuman strength. A younger Arthur Curry is portrayed by various actors including an uncredited infant, Tainu and Tamor Kirkwood at age 3, Kaan Guldur at age 9, Otis Dhanji at age 13, and Kekoa Kekumano at age 16. Princess of Xebel, Arthur Curry's love interest, a warrior and daughter of King Nereus. She was raised by Queen Atlanna and groomed to become queen. Mera possesses hydrokinetic and telepathic powers that allow her to control her aquatic environment and communicate with other Atlanteans. Atlantis' counselor, who was a mentor of Arthur Curry when he was young. He trained him to fight as well. Arthur Curry's Atlantean half-brother and ruler of Atlantis, who seeks to unite the seven underwater kingdoms to declare war on the surface world out of the belief that humanity polluted the seas. The king of the Atlantean tribe of Xebel and Mera's father, who allies with Orm. A ruthless pirate and a high-seas mercenary with a flair for creating deadly technological innovations. The Queen of Atlantis, mother of Arthur Curry and Orm. Additionally, Temuera Morrison portrays Thomas Curry, a lighthouse keeper who is Arthur Curry's father; Ludi Lin portrays Murk, the Captain of the Men-of-War, the frontline army of Atlantis; Randall Park portrays Dr. Stephen Shin, a marine biologist obsessed with finding the lost city of Atlantis; Graham McTavish portrays Atlan, the first king of Atlantis and the ancestor of Atlanna, Orm, and Arthur; and Michael Beach portrays Jesse Kane, a member of a group of pirates and David Kane's father. Djimon Hounsou, Natalia Safran, and Sophia Forrest play the Fishermen King Ricou, the Fishermen Queen Rina, and the Fishermen Princess respectively, the fish-like merpeople whom Orm creates an alliance with as part of his plan to unite the seven kingdoms of the sea. Julie Andrews provides the voice of Karathen, a mythical leviathan that allies with Aquaman. Andrew Crawford also provides the motion-capture of the Brine King, who is voiced by John Rhys-Davies. Leigh Whannell, Wan's long time collaborator, appears in the film as a plane pilot. In 2004, FilmJerk.com reported that Sunrise Entertainment's Alan and Peter Riche planned to bring Aquaman to the big screen for Warner Bros., with Robert Ben Garant writing the screenplay. However, the film fell through. In July 2009, it was reported that Aquaman was in development at Leonardo DiCaprio's Appian Way, and Warner chairman and CEO Barry Meyer said that the Aquaman film was in development. After Man of Steel's release in 2013, a source from Warner Bros. told The Wrap that they were discussing future films, with the mention of more Man of Steel movies as well as a Superman/Batman film, a Wonder Woman film, and an Aquaman film. Geoff Johns told Variety that Aquaman is a priority character for the company. It was announced on August 12, 2014, that Warner Bros. had hired screenwriters Will Beall and Kurt Johnstad to pen two separate scripts for an Aquaman film. The film was being developed on dual tracks, meaning that one script was being written by Beall and one by Johnstad, but only the better version would move forward. On April 10, 2015, The Hollywood Reporter reported that James Wan was the frontrunner to direct the film. In June 2015, Wan was confirmed to direct, and overlook the screenplay by Johnstad. On November 12, 2015, David Leslie Johnson-McGoldrick was hired to write the script, however it was unclear whether he would be writing a separate script or working with Wan. It was then revealed that previous script plans had been scrapped and that both Wan and Johns planned to move forward with a new script written by Beall. Later, Johnson-McGoldrick was brought back to the project to work on a rewrite of Beall's script. On March 2016, it was announced that the events of Aquaman will be set after Justice League. Wan confirmed later on Twitter that cinematographer Don Burgess, who had previously worked with Wan on The Conjuring 2, would serve as cinematographer for Aquaman. Pre-production began in Australia in late November 2016. In October 2014, Warner Bros. announced Aquaman as a part of the DC Extended Universe, with Jason Momoa starring. On October 20, 2014, in an interview with ComicBook.com, Momoa revealed that he was preparing for a Justice League film, and that he did not know if a solo Aquaman film would come before or after Justice League. He thought it might be an origin story of where Aquaman came from. 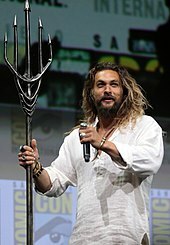 In December 2014, it was revealed that Momoa had signed a four-picture deal with the studio and DC, and he wanted Zack Snyder to direct the solo Aquaman film. On January 13, 2016, The Hollywood Reporter announced that Amber Heard had entered negotiations to play the female lead role of Mera, Aquaman's love interest; her casting was confirmed two months later. In April 2016, Willem Dafoe was cast in an undisclosed role, later revealed to be Nuidis Vulko. On December 12, 2016 it was confirmed that Patrick Wilson would play the villainous Ocean Master, the half-brother of Aquaman. On January 31, 2017, Yahya Abdul-Mateen II was added to the cast as Black Manta, Aquaman's archenemy in the comics. That same day, press reports noted that Nicole Kidman had entered talks to play Queen Atlanna. Two months later, Kidman confirmed her participation in the film. By February 2017, New Zealand actor Temuera Morrison had entered talks to play Thomas Curry, Aquaman's human father. On April 12, Dolph Lundgren was cast to play Nereus, king of Xebel. Ludi Lin was cast in the film on May 15, 2017. Almost two weeks later, Michael Beach, who voiced Devil Ray, a character loosely based on Black Manta in Justice League Unlimited, was cast as Black Manta's father. In October 2017, Graham McTavish revealed that he has a role in the film. In April 2018, Randall Park was cast as Dr. Stephen Shin, and in July, Djimon Hounsou, Natalia Safran and Sophia Forrest were cast as the Fisherman King, Fisherman Queen and the Fisherman Princess, respectively. In November 2018, it was revealed that Julie Andrews has a voice role in the film. Principal photography began in Australia on May 2, 2017, under the working title Ahab. A majority of the film was shot at Village Roadshow Studios in Gold Coast, Queensland, with production also held in Newfoundland, Canada, as well as in Italy (Sicily) and Morocco. Between May and August 2017, production also took place on location around a number of places on the Australian Gold Coast, including Main Beach, Coomera, Southport and Amity Point in North Stradbroke Island, Queensland, as well as Hastings Point in New South Wales. On filming underwater sequences, Wan stated that "the underwater world is super complicated" and "it's not an easy shoot." Filming began on the Arthur Curry Lighthouse set at Hastings Point on August 11, 2017, and ended later that month. In September, during an interview with Kiss Radio, actor Ludi Lin described Wan's vision for the film as "Star Wars underwater." That same month, filming took place in Newfoundland and Labrador. Willem Dafoe finished up his part by late September. On October 13, James Wan announced that Patrick Wilson wrapped on the film. Filming on location took place in the deserts of Morocco by mid-October, which included the cities of Merzouga and Erfoud. Principal photography wrapped on October 21, 2017. James Wan's five-time collaborator Kirk Morri served as the editor for Aquaman. Two-time Academy Award winner Charles Gibson (Babe and Pirates of the Caribbean: Dead Man's Chest), and Kelvin McIlwain (The Fast and the Furious franchise), served as overall visual effects supervisors. On November 3, 2018, Wan announced that post-production on the film was complete. On March 7, 2018, Rupert Gregson-Williams was announced as the composer for Aquaman. Gregson-Williams previously wrote the score for Wonder Woman, the fourth film in the DC Extended Universe. The soundtrack was released by WaterTower Music on December 14, 2018. The album features an original song by American musician Skylar Grey titled "Everything I Need", written by Grey and Elliott Taylor. The second trailer featured a piece called "Sidewinder" from composer Phil Lober of Ghostwriter Music. Altogether there are 2,300 visual effects shots in the movie completed by Industrial Light & Magic (ILM), Rodeo FX, Scanline VFX, DNEG, Moving Picture Company (MPC), Method Studios, Digital Domain and Weta Digital. The visual effects for the director's cut of the film were created at the same time as the theatrical cut. ILM was the lead VFX vendor and worked on creating Atlantis and all its CG animals, the Karathen and the final battle of the film. Jeff White served as the VFX supervisor for ILM on Aquaman. For the underwater sequences, the actors were shot dry-for-wet on special tuning fork rigs designed by the FX team and later the bodies of the actors were replaced with digital doubles in post-production. For creating Atlantis the team relied on the designs provided by the art department. ILM’s environment team created over 200 buildings, including the signature jellyfish buildings, and laid over 7000 buildings in districts covering almost 600 sq miles for the action to travel through. The underwater ships were modelled off organic creatures and designed to move that way. For the entrance to Atlantis sequence the team built over 150,000 ships to fill the traffic lanes leading into Atlantis. All the animals, including the Karathen, were built by ILM and animated using keyframe animation. Approximately 700 shots in the film required high detail hair simulations. ILM had to significantly improve their hair simulation software due to the unique aspects of hair flowing underwater. Normally hair simulations use guide strands to define or influence the movement of groups of hair strands. This did not provide a satisfying look for underwater simulation, so ultimately ILM simulated strands individually, which resulted in heavy computations. Additionally, Wan wanted to be able to direct the hair when the physically accurate simulation resulted in undesirable results. ILM delivered 670 shots for the film. Additionally, DNEG worked on digitally de-ageing Willem Dafoe for the scene where his character Nudris Vulko trains the young Arthur Curry. Jay Barton served as the VFX supervisor for Digital Domain. They worked on creating the Dead King’s Island environment. For the sequence, the actors were shot in a pool of water against blue screen backgrounds, with Digital Domain adding CG extensions, waterfalls, mountains and dinosaurs in post production. Most of the waterfalls that appear in the scene were created using Houdini while some were created using practical elements of things such as pouring salt and glass beads. They also built an extensive library of shot FX elements. The dinosaurs were animated using keyframe animation. Digital Domain delivered 19-20 shots for the movie. David Nelson and Craig Wentworth served as VFX supervisors for Method Studios. Method handled the Sicily fight sequence between Arthur, Mera and Black Manta; Arthur's encounter with the Karathen in the Well of the Souls and his acquisition of Atlan's Trident. For the Sicily fight sequence the team built the main square of the Italian village and terracotta tiled roof set pieces that were backed with blue screen. A completely CG village was also created based on scans and documentation of the real village. For the Well of the Souls sequence Momoa was filmed dry-for-wet and captured on set in rigs that simulated underwater movements, but they ultimately felt restrictive so artists replaced the majority of his performance with a digital body double and added the CG environment, Karathen and Arthur’s free-flowing locks. A specially designed 700fps shot was used in the scene where the camera travels through Arthur's eyes. Rodeo FX worked on two key sequences for the film, with Sebastien Moreau leading as VFX Supervisor for the film. For the aquarium that young Arthur Curry visits near the beginning of the film, Rodeo FX used a large volume of simulations as well as algorithms for the fish behavior. They created hard and soft corals by developing a colonization growth system, along with procedural stem and tentacle generation tools. They also created the environments for the Atlantis ruins below the desert. Artists used a lego-type approach to layer the environment with a large amount of sand, dust and rocks, all of which would realistically give way to the characters’ interactions. From there, they sculpted ruined buildings, bridges, towers, statues and temples, which were textured and shaded to add depth to the ruined city. Scanline VFX delivered 450 shots for the movie. Bryan Hirota served as VFX supervisor for scanline. The main sequences produced by them are: the lighthouse and it's surrounding environment, the “Aquaman” title card that follows the Boston aquarium, Aquaman pushing the submarine to the surface and rescuing the sailors inside, Orm’s tidal wave that sweeps away Arthur and Tom, including the rescue and aftermath, Black Manta being paid by Orm for the submarine’s delivery, and Arthur and Mera’s visit to the Kingdom of the Trench. For the creation of the film's title card the team relied on Rodeo's work on the aquarium sequence and simulated up to 60,000 fish. The tidal wave sequence was realized with a large-scale simulated wave, which was integrated with a combination of day for night footage, blue screen shots for the actors in truck interiors, a truck on a rotisserie rig, an interior cabin in a water tank, and VFX simulations for debris. For creating the lighthouse a full-size house with the base of the lighthouse tower was constructed by the FX team. Additional house and dock sets were built on sound stages. A digital build-out was done to complete the lighthouse tower and extend the dock fully out into sea. For the sequence where the camera pushes into a toy snow globe with a tiny lighthouse inside, a CG transition was created from the lighthouse's living room set to a fully CG winter coastline. For creating the Trench creatures, motion capture was done on set by stunt performers. Aquaman had its world premiere at the Empire, Leicester Square in London on November 26, 2018. It was released in the United States by Warner Bros. Pictures in RealD 3D, Dolby Cinema, IMAX and IMAX 3D on December 21, 2018. It had previously been set for July 27, 2018, and was then moved to October 5, 2018, before settling on its December release date. On November 19, 2018, Atom Tickets announced that Amazon Prime members in the United States would have early access to tickets for a December 15 screening of the film at select Regal, National Amusements, ArcLight Cinemas, and AMC theaters. Internationally, the film was released in China on December 7, 2018, in the United Kingdom on December 12, 2018, in Argentina, Brazil and Russia on December 13, 2018, and in India on December 14, 2018. In March 2017, prior to filming, a first look at Aquaman was shown during the CinemaCon convention in Las Vegas, Nevada, with Momoa introducing a video of director James Wan displaying a concept art sizzle reel for the film. Later, on July 22, the film's first footage made its debut at San Diego Comic-Con (SDCC) 2017 with a teaser presented by Momoa during the Warner Bros. panel at Hall H; director Wan presented the footage, stating that "in a lot of ways, this is an origin story," referring to the film. In April 2018, another teaser, with new rough footage, was shown by Wan and Momoa at CinemaCon, joined by Amber Heard, Patrick Wilson and Yahya Abdul-Mateen II on stage. In an interview with Entertainment Weekly during the event, Wan teased the conflict between Arthur Curry and his half-brother and main antagonist in the film, Orm / Ocean Master, stating that "it's almost a very classic Shakespearean story about brother from another world vs. brother from another world. And it really is a classic story of sibling rivalry." On June 11, 2018, the film's first trailer was previewed at the European exhibitors' conference CineEurope in Barcelona, Spain. On July 21, 2018, the first trailer was released at the SDCC 2018, being considered the best received trailer during the international convention; it was later attached to theatrical showings of Teen Titans Go! To the Movies, Mission: Impossible – Fallout, The Meg, The Predator, and Venom. 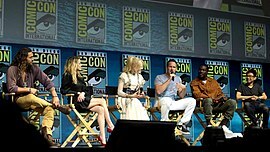 The cast also appeared as guests on the late-night talk show Conan with Conan O'Brien during SDCC, on Sunday, July 22. By late August of the same year, the studio held early test screenings, with mixed to positive reactions shared in social media, describing the film as good but not great. On October 5, 2018, a 5-minute Extended Video was released by Warner Bros. It received positive reactions from audiences, with praise directed towards the special effects, action, cinematography, and faithfulness to the comic book. The first official TV spot for the film was released by the studio on October 16, 2018, followed by a second on November 1, 2018. The same month, character posters were released for Aquaman, Mera, Black Manta, Ocean Master, King Nereus, Queen Atlanna and Nuidis Vulko. On November 7, 2018, the studio announced the schedule for the worldwide promotion tour, taking place during the months of November and December, with fan events, screenings and premieres in major cities around the globe, including Beijing, London, New York City, Manila, Los Angeles, Miami, Gold Coast, Sydney, and Hawaii. Additionally, it was announced that the film would be screened on December 7, 2018, during Brazil Comic Con (CCXP) in São Paulo. The following week, an official behind the scenes featurette was released, which included footage not seen before in the mainstream trailers. Two days later, the film's two main posters were released, with Aquaman and Mera showing off their comic-accurate suits. On November 19, 2018, the final trailer for the film was released, alongside the announcement of the beginning of ticket sales. The same day, 30 minutes of footage was shown in China during the first stop of the film's promotion tour, generating rave reactions among attendees. The financial success of the film has been attributed to the studio's marketing plan, attracting a wide range of demographics (particularly women) through advertising, social media and promotional partners worldwide. Aquaman was released for digital download on March 5, 2019, and on Blu-ray, 4K Blu-ray Ultra HD, 3D Blu-ray and DVD on March 26, 2019. Aquaman grossed $335.1 million in the United States and Canada, and $812.6 million in other territories, for a total worldwide gross of $1.148 billion. Worldwide, it became the highest-grossing installment in the DCEU, as well as film based on any characters from the DC comics. Deadline Hollywood calculated the net profit of the film to be $260.5 million, when factoring together all expenses and revenues, making it the fifth most profitable release of 2018. The day after announcing the early Amazon screenings, Aquaman's first 24-hour pre-sale totals became the highest in the history of Atom Tickets, beating out Avengers: Infinity War, as well as outpacing Jumanji: Welcome to the Jungle, another film Amazon Prime offered early to subscribers, the previous December. The film made $2.9 million from the Amazon preview screenings at 1,225 theaters, higher than the $1.86 million made by Jumanji: Welcome to the Jungle. In the United States and Canada, Aquaman was released alongside Bumblebee, Second Act, and Welcome to Marwen, and was projected to gross $65–70 million in its opening weekend, and $120 million over its first five days (with some tracking figures going as high as $150 million). The film made $28 million on its first day, including $9 million from Thursday night previews (a total of $13.7 million including the Amazon screenings and a Wednesday preview). It went on to debut to $67.9 million ($73.2 million including all early showings), topping the box office but marking the lowest opening of the DCEU. It then made $11 million on Monday and $22.1 million on Christmas Day, one of six films to ever gross over $20 million on the holiday; its five-day total opening was $105.7 million. The film made $52.1 million in its second weekend, a drop of 23%, as well as $10.1 million on New Year's Eve and $16.8 million on New Year's Day. The film then remained in first for a third consecutive weekend, grossing $31 million. The film made $17.4 million in its fourth weekend of release but was upset by The Upside, which exceeded expectations to debut to $20.4 million and dethrone Aquaman atop the box office. In China, where the film was released two weeks prior to its US debut, the film made $24.6 million (¥169.5 million) on its first day, representing 86% of the market share and setting a Warner Bros. opening day record in the country. It went on to debut to $93.6 million (¥644.8 million), marking the best-ever opening for the DCEU, Warner Bros. and a December release in the country. It also overtook the entire lifetime gross of Wonder Woman there in just three days. The film grossed $12.99 million on Monday, thus crossing $100 million ($107.7 million). By Thursday, its fifth day of release, the film had made $135.3 million, surpassing the lifetime totals of every solo Marvel Cinematic Universe film. As of April 4, 2019[update], the film has grossed $298.33 million in China. In the Philippines, Aquaman is the biggest Warner Bros. and DC film of all-time, with a cumulative gross of Php 536.4-million, surpassing Justice League and becoming the 6th-most successful film of all-time in the country. The film became the highest grossing film of the decade in Romania. On review aggregator, Rotten Tomatoes, the film holds an approval rating of 65% based on 352 reviews, with an average rating of 6.04/10. The website's critical consensus reads, "Aquaman swims with its entertainingly ludicrous tide, offering up CGI superhero spectacle that delivers energetic action with an emphasis on good old-fashioned fun." Metacritic surveyed 49 critics' reviews and assessed 22 as positive, 21 as mixed and 6 as negative; the website assigned an aggregate score of 55 out of 100, indicating "mixed or average reviews". Audiences polled by CinemaScore gave the film an average grade of "A−" on an A+ to F scale, while those at PostTrak gave it an 82% overall positive score and a 69% "definite recommend". Peter Debruge of Variety criticized the dialogue but praised Wan's direction, the production design, and the final act, writing, "The biggest surprise here is how, after the running time of a standard-length film has elapsed, Aquaman suddenly kicks the movie up a level for the finale. At just the moment this critic's eyes tend to glaze over in superhero movies—typically, as the villain goes nuclear and a portal to another dimension opens, threatening to destroy the planet—Wan unleashes a massive deep-sea battle on par with The Lord of the Rings." Germain Lussier of io9 wrote "Aquaman is all about spectacle. It's filled with ambition. It's always about trying to put the coolest, most imaginative sequence on screen at every single turn of the story, no matter what the cost." Writing for TheWrap, William Bibbiani called the film "a weird and wonderful superhero adventure that strives—and almost succeeds—to be the most epic superhero movie ever made." Writing for Rolling Stone, Peter Travers gave the film ​2 1⁄2 out of 5 stars, praising Wan's ambition and Momoa's performance but criticizing the plot and dialogue, writing: "Aquaman is a mess of clashing tones and shameless silliness, but a relief after all the franchise's recent superhero gloom." Chris Nashawaty of Entertainment Weekly graded the film a C−, writing, "It can't decide if it wants to be silly or serious—a superhero movie or a parody of one...Unfortunately, the bloated, waterlogged film is loaded with crummy CGI, cheesy costumes, and groaner dialogue delivered by actors who are too good to traffic in such nonsense". For the Chicago Tribune, Michael Phillips gave the film 1.5 stars out of 4, criticizing the film's script and Wan's direction, saying, "Watching this movie is like spending two hours and 27 minutes staring at a gigantic aquarium full of digital sea creatures and actors on wires, pretending to swim." In December 2018, it was reported that Warner Bros. Pictures chairman Toby Emmerich had the studio start developing a sequel. Discussions of a followup film had began during post-production, when director James Wan stated to TotalFilm that the first film purposefully left room for further stories. Jason Momoa told SyfyWire that he had the beginning for a sequel written, and that after he pitched it to the studio through Emmerich and Safran, they were receptive and enthusiastic about his ideas. In January 2019, the sequel was officially confirmed to be in development, with the studio already courting Wan to return for it. The following month, David Leslie Johnson-McGoldrick, co-writer of the first film, signed on as the screenwriter for the sequel. Warner Bros. confirmed via The Hollywood Reporter that the studio has set a release date of December 16, 2022. In February 2019, Warner Bros. announced that a "horror-tinged" spin-off called The Trench was in development. Wan will produce while Noah Gardner and Aidan Fitzgerald were asked to pen the script. The movie will focus on the amphibious monsters that Arthur and Mera faced in the previous film. ^ As depicted in the 2017 film Justice League. ^ a b c "Film Releases". Variety Insight. Archived from the original on September 3, 2018. Retrieved September 3, 2018. ^ Kit, Borys. "Geoff Johns Exits DC Entertainment for Writing and Producing Deal (Exclusive)". The Hollywood Reporter. Archived from the original on July 28, 2018. Retrieved July 13, 2018. ^ "Aquaman (2018)". British Board of Film Classification. Retrieved November 27, 2018. ^ Clark, Travis (December 19, 2018). "'Aquaman' has already made more money than its production budget, and is looking at a big opening in the US". Business Insider. Archived from the original on December 7, 2018. Retrieved January 18, 2019. ^ Mendelson, Scott (December 25, 2018). "'Aquaman' Tops $500 Million: DC Films Ranked From Worst To Best". Forbes. Archived from the original on December 25, 2018. Retrieved March 17, 2019. ^ a b D'Alessandro, Anthony (December 18, 2018). "'Aquaman' Darting To $120M+ In Competitive Christmas 5-Day Corridor – Box Office Preview". Deadline Hollywood. Retrieved December 18, 2018. ^ a b "Aquaman (2018)". Box Office Mojo. Retrieved April 1, 2019. ^ Mendelson, Scott. "Box Office: 'Aquaman' Tops 'Dark Knight Rises' To Become DC Comics' Biggest Movie". Forbes. Retrieved 2019-01-29. ^ "Film critics hail Aquaman the 'most ambitious DC movie to date'". Metro. 2018-11-27. Retrieved 2019-04-17. ^ "Aquaman Movie Early Reactions Praise James Wan's DC Film". ScreenRant. 2018-11-26. Retrieved 2019-04-17. ^ February 21, Anthony Mauro on; 2018 (2018-02-21). "'Aquaman' Test Screening Reactions Praise The Action In An Emotional Film". Heroic Hollywood. Retrieved 2019-04-17. ^ Sporn, Natasha (3 December 2018). "Jason Momoa: Aquaman is the closest I've come to playing myself". Insider. Retrieved 1 April 2019. ^ "Looks Like Young Aquaman Has Been Cast". May 5, 2017. Archived from the original on May 5, 2017. Retrieved May 5, 2017. ^ a b Kit, Borys (January 13, 2016). "Amber Heard in Talks to Star in 'Aquaman' (Exclusive)". The Hollywood Reporter. Archived from the original on January 16, 2016. Retrieved January 14, 2016. ^ a b Kit, Borys (April 19, 2016). "'Justice League' Adds Willem Dafoe to Cast (Exclusive)". The Hollywood Reporter. Archived from the original on January 15, 2017. Retrieved September 27, 2017. ^ a b O'Connell, Sean (June 21, 2016). "Who Willem Dafoe Is Playing In Justice League". Cinemablend. Archived from the original on June 24, 2016. Retrieved March 4, 2018. ^ a b Flemming, Mike (December 12, 2016). "Patrick Wilson To Play 'Aquaman's Evil Half-Brother ORM". Deadline Hollywood. Archived from the original on December 13, 2016. Retrieved December 12, 2016. ^ Hibberd, James (June 15, 2018). "Aquaman villain has an eco-warrior motive, Patrick Wilson reveals". EntertainmentWeekly. Archived from the original on June 16, 2018. Retrieved June 15, 2018. ^ White, James. "Aquaman Adds Dolph Lundgren As King Nereus". Empire. Archived from the original on April 17, 2017. Retrieved May 7, 2017. ^ Gaber, C.L. (February 17, 2018). "Dolph Lundgren on working out and working his way up". Las Vegas Review-Journal. Archived from the original on February 20, 2018. Retrieved March 4, 2018. ^ a b Kit, Borys (January 31, 2017). "'Aquaman' Finds Its Black Manta Villain With 'Get Down' Actor (Exclusive)". The Hollywood Reporter. Archived from the original on June 1, 2017. Retrieved June 1, 2017. ^ Hibberd, James (June 14, 2018). "Aquaman exclusive: First look at Black Manta". Entertainment Weekly. Archived from the original on June 14, 2018. Retrieved June 14, 2018. ^ "Aquaman: Nicole Kidman to play Jason Momoa's mother Queen Atlanna". Firstpost. April 4, 2017. Archived from the original on April 4, 2017. Retrieved May 7, 2017. ^ Knight, Lewis (14 December 2018). "Aquaman: Nicole Kidman reveals why she took the role of Queen Atlanna". Mirror. Retrieved 1 April 2019. ^ a b Kit, Borys (February 3, 2017). "'Star Wars' Actor Temuera Morrison In Talks to Join 'Aquaman' (Exclusive)". The Hollywood Repoter. Archived from the original on June 16, 2017. Retrieved September 17, 2017. ^ N'Duka, Amanda (May 15, 2017). "'Aquaman': 'Power Rangers' Star Ludi Lin Joins Jason Momoa In DC Comics Pic". Archived from the original on May 17, 2017. Retrieved May 15, 2017. ^ a b Wan, James [@creepypuppet] (April 12, 2018). "So happy and fortunate to be finally working with this man, @parkrandall, on pickups. #DrShin" (Tweet). Retrieved April 20, 2018 – via Twitter. ^ a b McTavish, Graham [@grahammctavish] (October 7, 2017). "Delighted to be able to announce my involvement in #Aquaman. Character has to be secret....for now. It's going to be awesome!" (Tweet). Retrieved October 8, 2017 – via Twitter. ^ a b "Aquaman: Michael Beach Confirms He Is Playing Black Manta's Father". DC. Archived from the original on May 27, 2017. Retrieved May 26, 2017. ^ a b "Things Are Looking Fishy in New 'Aquaman' Image". Collider. July 13, 2018. Archived from the original on July 13, 2018. Retrieved July 13, 2018. ^ a b Hibberd, James (November 23, 2018). "Exclusive: Julie Andrews has a secret role in 'Aquaman'". EW.com. Archived from the original on November 23, 2018. Retrieved November 23, 2018. ^ Daniels, Omari (December 22, 2018). "'Lord of The Rings' Actor Voiced [SPOILER] In 'Aquaman'". Heroic Hollywood. Retrieved December 27, 2018. ^ Wan, James (July 22, 2018). "I needed star-power to close the trailer with. @LWhannell". Twitter. Retrieved August 6, 2018. ^ Sampson, Mike (July 20, 2009). "Leo on Aquaman?". Joblo.com. Archived from the original on July 24, 2009. Retrieved September 13, 2010. ^ "Why 'Man of Steel' Holds The Key to Warner Bros.' Future Franchises". Quirky Byte. Quirky Byte. Retrieved 15 December 2018. ^ Kit, Borys (July 17, 2013). "DC Entertainment Chief Reveals What's Next for Superman, Wonder Woman and 5 Superheroes Who Deserve Movies (Q&A)". The Hollywood Reporter. Archived from the original on August 4, 2014. Retrieved July 18, 2013. ^ Sullivan, Kevin P. (July 19, 2013). "An 'Aquaman' Movie? DC Comics Head Would Love To See It Happen". MTV. Archived from the original on July 22, 2013. Retrieved July 20, 2013. ^ Steinberg, Brian (November 25, 2013). "DC Wants Aquaman To Make A Bigger Splash". Variety. Archived from the original on November 26, 2013. Retrieved November 26, 2013. ^ "'TMNT' Filmmakers Talk Aliens & Dimension X in 'Ninja Turtles' Sequels". The Hollywood Reporter. August 12, 2014. Archived from the original on August 14, 2014. Retrieved August 11, 2014. ^ Kit, Borys (April 10, 2015). "'Furious 7' Director James Wan Eyed for 'Aquaman' (Exclusive)". The Hollywood Reporter. Archived from the original on July 26, 2015. Retrieved May 6, 2015. ^ Fleming Jr., Mike (June 3, 2015). "James Wan Sets 'Aquaman' Deal To Direct Jason Momoa In DC Warners Pic". Deadline Hollywood. Archived from the original on June 3, 2015. Retrieved June 3, 2015. ^ Kroll, Justin (3 June 2015). "James Wan to Direct 'Aquaman' for Warner Bros". Variety. Retrieved 1 April 2019. ^ Kit, Borys (November 12, 2015). "'Aquaman' Hooks New Writer (Exclusive)". The Hollywood Reporter. Archived from the original on November 13, 2015. Retrieved November 13, 2015. ^ Kit, Borys (July 22, 2016). "'Aquaman' Movie Hooks 'Gangster Squad' Writer (Exclusive)". The Hollywood Reporter. Archived from the original on August 11, 2016. Retrieved July 29, 2016. ^ Busch, Anita (June 26, 2017). "The Conjuring 3 Summoned By New Line Cinema David Leslie Johnson Hired To Script". Deadline. Archived from the original on December 11, 2017. Retrieved December 7, 2017. ^ McNary, Dave (June 26, 2017). "The Conjuring 3 In The Works, David Leslie Johnson Hired To Write Script". Variety Magazine. Archived from the original on January 14, 2018. Retrieved December 7, 2017. ^ Fritz, Ben (March 11, 2016). "The Great Comic-Book Movie Debate". The Wall Street Journal. Archived from the original on March 12, 2017. Retrieved September 27, 2017. ^ Topel, Fred (March 27, 2016). "James Wan Talks 'Aquaman' Sea Monsters and More [Wondercon]". Slash Film. Archived from the original on September 28, 2017. Retrieved September 27, 2017. ^ Wan, James. "Don Burgess as cinematographer for Aquaman". Twitter. Archived from the original on February 23, 2017. Retrieved February 20, 2017. ^ McGloin, Matt (September 4, 2016). "Aquaman Films In Australia; Michael Kenneth Williams Said To Be Black Manta". CosmicBookNews. Archived from the original on October 10, 2016. Retrieved September 4, 2016. ^ Perry, Spencer (November 7, 2016). "Filming Locations for Deadpool 2, The Predator, and Aquaman". ComingSoon.net. Archived from the original on November 7, 2016. Retrieved November 8, 2016. ^ a b Fischer, Russ (October 15, 2014). "DC Comics Movies Announced: 'Suicide Squad,' 'Wonder Woman,' 'Justice League,' 'The Flash,' 'Aquaman'". /Film. Archived from the original on October 18, 2014. Retrieved October 15, 2014. ^ Perry, Spencer (December 8, 2014). "Jason Momoa Talks Aquaman, Wants Zack Snyder to Direct Solo Film". comingsoon.net. Archived from the original on January 20, 2015. Retrieved December 8, 2014. ^ "EXCLUSIVE: Amber Heard Confirms Her 'Aquaman' Role in 'Justice League', Dishes on 'Interesting' Mera Costume". Archived from the original on March 20, 2016. Retrieved September 9, 2016. ^ Kit, Borys (January 31, 2017). "Nicole Kidman in Talks to Join 'Aquaman' (Exclusive)". The Hollywood Repoter. Archived from the original on June 6, 2017. Retrieved June 1, 2017. ^ Nicole, Sperling (March 31, 2017). "Nicole Kidman explains why she's diving in for Aquaman". Entertainment Weekly. Archived from the original on April 1, 2017. Retrieved June 1, 2017. ^ Kit, Borys (April 12, 2017). "Dolph Lundgren Joins Jason Momoa in 'Aquaman' (Exclusive)". The Hollywood Repoter. Archived from the original on April 17, 2017. Retrieved September 17, 2017. ^ N'Duka, Amanda (May 15, 2017). "'Aquaman': 'Power Rangers' Star Ludi Lin Joins Jason Momoa In DC Comics Pic". Deadline Hollywood. Archived from the original on May 17, 2017. Retrieved May 15, 2017. ^ Wan, James [@creepypuppet] (May 2, 2017). "Months of intensive prep have led to this. Here we go. #DayOne #Ahab" (Tweet). Retrieved May 3, 2017 – via Twitter. ^ "Production is Underway on Warner Bros. Pictures' Super Hero Action Adventure "Aquaman"". Business Wire. May 3, 2017. Retrieved May 5, 2017. ^ Goodenough, Cheryl (May 9, 2017). "Filming for Aquaman movie on North Stradbroke Island". Redlandcitybulletin.com.au. Archived from the original on September 20, 2017. Retrieved September 19, 2017. ^ Simonot, Suzanne (August 2, 2017). "Nicole Kidman's first day at work on Aquaman set on Gold Coast". Goldcoastbulletin.com.au. Archived from the original on October 7, 2017. Retrieved September 8, 2017. ^ Eggertsen, Chris (August 10, 2017). "All That Water Is Making 'Aquaman' "Super Complicated" to Shoot". The Hollywood Reporter. Archived from the original on August 12, 2017. Retrieved August 12, 2017. ^ Evry, Max (August 11, 2017). "Filming Begins on the Aquaman Lighthouse Set". ComingSoon.net. Archived from the original on August 13, 2017. Retrieved August 12, 2017. ^ Stefansky, Emma (September 1, 2017). "James Wan describes 'Aquaman' as 'Star Wars' Underwater". Screencrush.com. Archived from the original on September 28, 2017. Retrieved September 27, 2017. ^ Bartlett, Geoff (September 5, 2017). "Superhero film Aquaman finishes shooting in Newfoundland". CBC.ca. Archived from the original on September 7, 2017. Retrieved September 8, 2017. ^ Ellwood, Gregory (September 27, 2017). "Willem Dafoe Finishes 'Aquaman' And Returns To 'The Florida Project' [Interview]". ThePlaylist.net. Retrieved September 28, 2017. ^ Wan, James [@creepypuppet] (October 13, 2017). "After 115-days of photography, that's a wrap on @patrickwilson73. Thank you for accompanying us on this aquatic adventure" (Tweet). Retrieved October 14, 2017 – via Twitter. ^ "'Aquaman' Superhero Film to Be Shot in Southern Moroccan Desert". MoroccoWorldNews.com. October 3, 2017. Archived from the original on April 5, 2018. Retrieved April 4, 2018. ^ Wan, James [@creepypuppet] (October 21, 2017). "Holy mackerel, you scampi serious — that's finally a principal photography WRAP on Aquaman!! Thank You to an awesome cast & crew" (Tweet). Retrieved October 21, 2017 – via Twitter. ^ "ANNOUNCEMENT: Production is Underway on Superhero Action Adventure Aquaman". Warner Bros UK. May 8, 2017. Archived from the original on September 10, 2017. Retrieved September 9, 2017. ^ "James Wan on Instagram: "After two years of consuming and devouring my every waking hour, this little indie movie is finally done. It was a monster undertaking. I..."". Instagram. Retrieved November 4, 2018. ^ "Rupert Gregson-Williams to Score James Wan's 'Aquaman'". Film Music Reporter. Archived from the original on March 8, 2018. Retrieved March 7, 2018. ^ Fabi, Tia (November 17, 2018). "Aquaman's Soundtrack Has Release Date". Gvnation.com. Archived from the original on November 18, 2018. Retrieved November 17, 2018. ^ "Aquaman". Hans-Zimmer.com. Archived from the original on November 18, 2018. Retrieved November 17, 2018. ^ "James Wan's 'Aquaman' to Feature Original Song by Skylar Grey". Film Music Reporter. Archived from the original on November 30, 2018. Retrieved November 29, 2018. ^ Lin, Craig. "Listen To The Epic Music From The Final 'Aquaman' Trailer". DC Films Hub. Retrieved 22 December 2018. ^ "Art of VFX Aquaman". Art of VFX. October 5, 2018. Archived from the original on August 11, 2018. Retrieved October 7, 2018. ^ "Visual Effects Aquaman". Animation Boss. July 21, 2018. Archived from the original on May 13, 2018. Retrieved August 8, 2018. ^ "Mastering Water: Producing the Effects for AQUAMAN". VFX Voice. February 12, 2019. Retrieved February 13, 2019. ^ a b "AQUAMAN: Kelvin McIlwain – Overall VFX Supervisor". The Art of VFX. 7 January 2019. Retrieved 2019-01-10. ^ a b "AQUAMAN: Jeff White (VFX Supervisor) and Cedric Lo (Animation Supervisor) – Industrial Light & Magic". The Art of VFX. January 9, 2019. ^ "AQUAMAN: Jay Barton – VFX Supervisor – Digital Domain". The Art of VFX. January 11, 2019. ^ "Aquaman: Josh Simmonds & Craig Wentworth – VFX supervisors – Method Studios". Art of VFX. January 29, 2019. Retrieved February 10, 2019. ^ "Aquaman VFX Breakdown". 3 January 2019. Retrieved 2019-01-10. ^ "Aquaman VFX Breakdown". January 3, 2019. ^ "AQUAMAN: Bryan Hirota – VFX Supervisor – Scanline VFX". The Art of VFX. 8 January 2019. Retrieved 2019-01-10. ^ "World Premiere: Aquaman". Heart of London Business Alliance. Archived from the original on November 23, 2018. Retrieved November 23, 2018. ^ Hipes, Patrick; D'Alessandro, Anthony (March 16, 2017). "'Aquaman' Swims To Christmas 2018 Date Where 'Avatar 2' Was". Deadline Hollywood. Archived from the original on August 26, 2018. Retrieved July 22, 2018. ^ Lincoln, Ross A. (December 3, 2016). "'Aquaman' To Swim Into Theaters October 2018". Deadline Hollywood. Archived from the original on August 26, 2018. Retrieved July 22, 2018. ^ McNary, Dave (December 2, 2016). "Jason Momoa's 'Aquaman' Gets Release Date From Warner Bros". Variety. Archived from the original on December 4, 2016. Retrieved December 3, 2016. ^ McNary, Dave (November 19, 2018). "Early Showings of 'Aquaman' Set for Amazon Prime Members". Variety. Archived from the original on November 20, 2018. Retrieved November 20, 2018. ^ Tartaglione, Nancy (October 15, 2018). "'Crazy Rich Asians' Finally Gets China Release Date; 'Aquaman' Diving In Early". Deadline Hollywood. Penske Business Media. Archived from the original on October 15, 2018. Retrieved October 15, 2018. ^ Sandwell, Ian (April 10, 2018). "Aquaman's release date has been moved forward". Digital Spy. Archived from the original on April 12, 2018. Retrieved April 12, 2018. ^ Johnston, Rich (November 19, 2018). "Aquaman UK Release Date Moves Up Two Days to the 12th December". Bleedingcool.com. Retrieved November 28, 2018. ^ AdoroCinema. "Aquaman: Lançamento no Brasil é antecipado". AdoroCinema. Archived from the original on October 19, 2018. Retrieved October 19, 2018. ^ "¿'Annabelle' en 'Aquaman'? | Fandango Argentina". www.fandango.lat (in Spanish). Retrieved 2018-12-30. ^ "Aquaman to release in India a week before US on December 14". Hindustan Times. November 13, 2018. Retrieved December 15, 2018. ^ Couch, Aaron (March 29, 2017). "'Aquaman' Shows Off Imaginative Concept Art at CinemaCon". The Hollywood Reporter. Archived from the original on September 19, 2017. Retrieved September 17, 2017. ^ Limbachia, Dixie. "'Aquaman' Movie: First Footage Debuts at Comic-Con". Variety. Archived from the original on September 17, 2017. Retrieved September 17, 2017. ^ Lang, Brent (April 24, 2018). "'Aquaman' Footage Debuts at CinemaCon; 'Wonder Woman 2' Details Revealed". Variety. Archived from the original on April 25, 2018. Retrieved April 25, 2018. ^ Gettel, Oliver (April 24, 2018). "Aquaman director James Wan teases a 'Shakespearean story' of sibling rivalry". Entertainment Weekly. Archived from the original on May 18, 2018. Retrieved May 18, 2018. ^ Ritman, Alex (June 12, 2018). "CineEurope: Warner Bros. Debuts Long-Awaited 'Aquaman' Trailer". TheHollywoodReporter. Archived from the original on June 12, 2018. Retrieved June 12, 2018. ^ Newby, Richard (July 22, 2018). "'Aquaman' Is Shaping Up to Be 'Game of Thrones' Underwater". TheHollywoodReporter. Archived from the original on July 26, 2018. Retrieved July 26, 2018. ^ Truitt, Brian. "Comic-Con: Watch Jason Momoa hit the high seas in the first 'Aquaman' trailer". usatoday.com. Archived from the original on July 21, 2018. Retrieved July 22, 2018. ^ Snierson, Dan (July 2, 2018). "Breaking Bad, Aquaman casts to appear on Conan at San Diego Comic-Con". Entertainment Weekly. Archived from the original on July 2, 2018. Retrieved July 2, 2018. ^ Lovett, Jamie (August 25, 2018). "First 'Aquaman' Movie Test Screenings Reactions Surface". ComicBook.com. Retrieved January 4, 2019. ^ Bui, Hoai-Tran (August 27, 2018). "First Reactions to the 'Aquaman' Test Screenings Surface". Slashfilm.com. Retrieved January 4, 2019. ^ Couch, Aaron (October 5, 2018). "'Aquaman' Unveils Extended, 5-Minute Look". TheHollywoodReporter. Archived from the original on October 6, 2018. Retrieved October 5, 2018. ^ Cavanaugh, Patrick. "Internet Reacts to New 'Aquaman' Trailer". ComicBook.com. Archived from the original on October 6, 2018. Retrieved October 5, 2018. ^ Jones, Wil. "Fans are going wild for the extended Aquaman trailer". Joe.co.uk. Archived from the original on October 5, 2018. Retrieved October 5, 2018. ^ Piers, Sebastian. "New 'Aquaman' Preview Has Fans Excited For The Next DC Film". HeroicHollywood. Archived from the original on October 6, 2018. Retrieved October 5, 2018. ^ "'Aquaman' TV Spot "Waves"". The Hollywood Reporter. October 17, 2018. Retrieved November 3, 2018. ^ "Aquaman - "Attitude" TV Spot". IGN. November 2, 2018. Archived from the original on November 3, 2018. Retrieved November 3, 2018. ^ McMillan, Graeme (November 7, 2018). "Meet the Undersea Seven in New 'Aquaman' Portrait Posters". The Hollywood Reporter. Archived from the original on November 7, 2018. Retrieved November 7, 2018. ^ ""Aquaman" to Take Epic Journey across the Seven Seas on Multi-City Global Tour". Business Wire. November 7, 2018. Retrieved November 7, 2018. ^ Weiss, Josh (November 5, 2018). "James Wan confirms Aquaman is officially done; first screening set for Brazil's Comic Con". SYFY Wire. Retrieved November 7, 2018. ^ Weiss, Josh (November 13, 2018). "Aquaman featurette offers BTS footage, explores the enigma of the sea". SYFY Wire. Archived from the original on November 17, 2018. Retrieved November 17, 2018. ^ Mendelson, Scott (November 15, 2018). "Why 'Aquaman' Got Two New Posters But Zero New Trailers This Week". Forbes. Archived from the original on November 17, 2018. Retrieved November 17, 2018. ^ Couch, Aaron (November 19, 2018). "Final 'Aquaman' Trailer Reveals the Hero's Journey". TheHollywoodReporter. Retrieved November 19, 2018. ^ Villaverde, Noah (November 24, 2018). "'Aquaman' Footage Draws Raves In China Screening". HeroicHollywood. Archived from the original on November 25, 2018. Retrieved November 24, 2018. ^ D'Alessandro, Anthony (December 26, 2018). "How Warner Bros. Attracted Women To 'Aquaman' & Opened DC Superhero Pic To $105M+". Deadline Hollywood. Retrieved January 4, 2019. ^ "Aquaman iTunes". Blu-ray.com. Retrieved February 5, 2019. ^ "Aquaman Blu-ray". Blu-ray.com. Retrieved February 8, 2019. ^ "DC Comics at the Box Office". Box Office Mojo. Retrieved April 8, 2019. ^ D'Alessandro, Anthony (March 28, 2019). "James Wan's $1B+ 'Aquaman' Became DC's Lifeboat After 'Justice League' Debacle: No. 5 In 2018 Most Valuable Blockbuster Tournament". Deadline Hollywood. Retrieved March 29, 2019. ^ D'Alessandro, Anthony (November 20, 2018). "'Aquaman' First Day Ticket Sales Robust: Atom Hits 24-Hour Record; DC Superhero Pic Beating 'Venom' On Fandango". Deadline Hollywood. Archived from the original on November 20, 2018. Retrieved November 21, 2018. ^ "'Aquaman' Has Already Beaten One 'Avengers: Infinity War' Record". DC. Retrieved November 22, 2018. ^ D'Alessandro, Anthony (December 16, 2018). "'Aquaman' Amazon Prime Previews Hook Near $3M Besting 'Jumanji 2'". Deadline Hollywood. Retrieved December 16, 2018. ^ "Weekend Box Office Results for December 21-23, 2018". Box Office Mojo. Retrieved January 3, 2019. ^ a b D'Alessandro, Anthony (December 26, 2018). "'Aquaman' Unwraps $22M+ On Christmas For $105M+ Cume; 'Holmes & Watson' Opens To $6M+; 'Vice' $4M+". Deadline Hollywood. Retrieved December 26, 2018. ^ D'Alessandro, Anthony (January 2, 2018). "'Aquaman' Sailing To $52M+ 2nd Weekend; $189M+ Cume Pacing Ahead Of 'Doctor Strange' & 'Guardians Of The Galaxy'". Deadline Hollywood. Retrieved January 2, 2019. ^ Brent Lang (January 1, 2018). "'Aquaman' Leads New Year's Eve Box Office With $10.1 Million". Variety. Retrieved January 2, 2018. ^ D'Alessandro, Anthony (January 13, 2018). "'Upside' Set To Be STX's First No. 1 Opener With $19M+; 'Aquaman' Flips Over $1B WW; Keanu Reeves Hits B.O. Low With 'Replicas'". Deadline Hollywood. Retrieved January 13, 2019. ^ Tartaglione, Nancy (December 9, 2018). "'Aquaman' Dives Into China With $94M; Best-Ever WB, DC & December Bow – International Box Office". Deadline Hollywood. Archived from the original on December 8, 2018. Retrieved December 9, 2018. ^ Mendelson, Scott. "China Box Office: 'Aquaman' Crosses $100 Million To Top 'Justice League' And 'Logan'". Forbes. Archived from the original on December 10, 2018. Retrieved December 11, 2018. ^ Scott Mendelson (December 18, 2018). "Box Office: 'Aquaman' Swims Past Every Solo Marvel Movie (In China)". Forbes. Retrieved December 14, 2018. ^ "Aquaman (2018) - International Box Office Results - Box Office Mojo". www.boxofficemojo.com. Retrieved 2019-04-04. ^ "'Aquaman' takes in over $1 billion worldwide; biggest DC film in PH with P536.4-M". Cinema Bravo. January 15, 2019. ^ SA, Imedia Plus Group. "Aquaman, filmul cu cele mai mari încasări al deceniului în România". Cinemagia. ^ "Aquaman (2018)". Rotten Tomatoes. Fandango Media. Retrieved March 30, 2019. ^ "Aquaman reviews". Metacritic. Retrieved December 23, 2018. ^ Debruge, Peter (December 11, 2018). "Film Review: Aquaman". Variety. Retrieved December 11, 2018. ^ Lussier, Germain (December 11, 2018). "James Wan's Aquaman Is Bursting With Ambition and Spectacle". io9. Retrieved December 11, 2018. ^ Bibbiani, William (December 11, 2018). "Aquaman Film Review: James Wan's Outrageous Underwater Epic Rewrites the Superhero Rules". TheWrap. Retrieved December 11, 2018. ^ Travers, Peter (December 18, 2018). "'Aquaman' Review: D.C. Superhero's Solo Movie Is a Waterlogged Mess". Rolling Stone. Retrieved January 9, 2019. ^ Nastawaty, Chris (December 11, 2018). "The goofy, overstuffed Aquaman sleeps with the fishes: EW review". Entertainment Weekly. Retrieved December 11, 2018. ^ Phillips, Michael (December 11, 2018). "Aquaman review: It has surf. It has turf. And not much else". Chicago Tribune. Retrieved December 11, 2018. ^ "2018 EDA Award Nominees". Alliance of Women Film Journalists. December 20, 2018. Retrieved January 10, 2019. ^ "Gold Derby Film Awards nominations 2019: 'The Favourite' and 'A Star is Born' come out on top". Gold Derby. January 30, 2019. Retrieved March 14, 2019. ^ Pedersen, Erik (January 10, 2019). "CDGA Nominations: 'Crazy Rich Asians', 'Black Panther' Among Pics Fitted For Costume Designers' List". Deadline Hollywood. Retrieved January 10, 2019. ^ Kilkenny, Katie (January 3, 2019). "'The Favourite,' 'Pose,' 'Killing Eve' Lead Dorian Award Nominations". The Hollywood Reporter. Retrieved January 10, 2019. ^ Pedersen, Erik (January 18, 2019). "Motion Picture Sound Editors Reveal 2019 Golden Reel Nominations". Deadline Hollywood. Retrieved January 18, 2019. ^ Pedersen, Erik (January 10, 2019). "Make-Up Artists & Hair Styling Guild Applies Its Awards Nominations". Deadline Hollywood. Retrieved January 10, 2019. ^ Hipes, Patrick (January 15, 2019). "VES Awards Nominations". Deadline Hollywood. Retrieved January 15, 2019. ^ Siegel, Tatiana. "Amber Heard on Her Secret Passion, Elon Musk and a Splashy New Role". The Hollywood Reporter. Retrieved December 6, 2018. ^ a b Oller, Jacob (October 19, 2018). "JASON MOMOA HAS ALREADY PITCHED HIS PLAN FOR AQUAMAN 2 TO WARNER BROS". Syfy. Archived from the original on October 19, 2018. Retrieved December 7, 2018. ^ Geoff Boucher (January 25, 2019). "'Aquaman' Sequel: James Wan Seeking Seaworthy Script As First Film Makes DC History". Deadline Hollywood. ^ D'Alessandro, Anthony (February 11, 2019). "'Aquaman 2' Being Penned By David Leslie Johnson-McGoldrick". Deadline Hollywood. Retrieved March 4, 2019. ^ Couch Aaron, McClintock Pamela (February 27, 2019). "'Aquaman 2' Sets December 2022 Release Date". The Hollywood Reporter. ^ Kit, Borys (February 8, 2019). "'Aquaman' Spinoff 'The Trench' in the Works (Exclusive)". The Hollywood Reporter. Retrieved February 8, 2019.